I've always been interested in solar energy, so in 2008, when we heard that there were good subsidies available for home solar power, we decided to go for it. We asked for bids from four contractors from the list at gosolarcalifornia.org. Three proposed BP Solar panels; Absolutely Solar proposed Mitsubishi PV-UD175 175 watt panels. We went with them because Mitsubishi panels had tighter power tolerances (+-3% instead of +- 9%), and were lead free. LA County's wonderful Solar Map estimates the house has room for 875 square feet of solar. 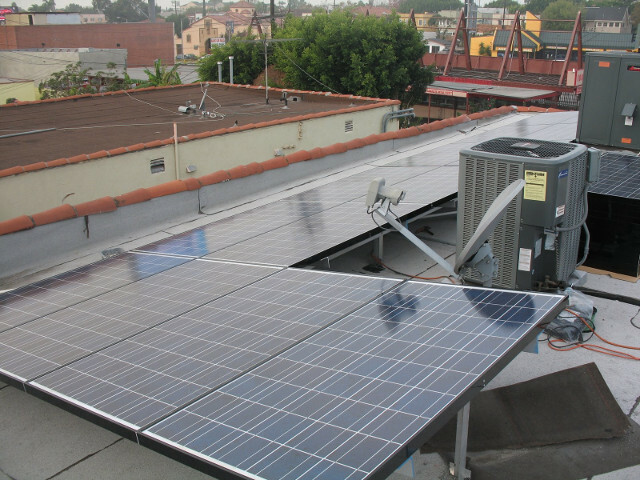 And it isn't far off; we installed 46 panels for a total of about 780 square feet and 8050 watts. The power is converted to AC by two 95% efficient Xantrex GT4.0 inverters (one for each unit of our duplex). Unfortunately, over the same period, the house used 65 kwh/day average. Our power meters did spin backwards part of the year, and we did bank quite a few kilowatthours, but we blew it by installing an electric hot tub heater, by not doing any energy efficiency improvements, and by sticking with incandescent light bulbs. Next time we'll do the efficiency improvements first. The total cost was $69K, but thanks to a $26k rebate from Los Angeles DWP and a $20K federal tax credit, the net cost was only $23K (or about $3 per watt). Assuming a 20 year lifespan, that's a net cost of $1200/year, or $100/month, or $3/day. As of 2015, we pay $0.17 per kwh including all fees, so the 37 kwh/day it generates reduces our bills by about $6/day. Thus -- assuming no upkeep costs -- we net $3/day on our $23k investment. Alternately, you could say it'll pay for itself in about 10 years. The panels get quite dirty (it's next to a very busy street). We measured about a 6%-10% increase in output after a thorough cleaning after a year of not cleaning (i.e. every day for a week before and after the cleaning, I checked the total generation meter for one unit at 8am; the best day before was 24.0, best day after was 26.6. That would be a 10% improvement. Average for a different week prior to the cleaning was 24.8, though, which would be a 6% improvement. Next time I'll measure even more carefully.) We now own a long telescoping window cleaner's squeegee/mop ($75 from the local cleaning supply store) and clean the panels ourselves once every year or so. At the beginning of 2015, we replaced about 25 out of forty 60 watt light bulbs in the upper unit with Osram/Sylvania 2700K 6W LED bulbs (the best bulb on the market at the moment IMHO; $8 at Lowe's). This got the meters in the upper unit to spin backwards as of March, but to get to net zero for the year, we'll need a lot more efficiency improvements.